2003-06-13 Assigned to SILECS OY reassignment SILECS OY ASSIGNMENT OF ASSIGNORS INTEREST (SEE DOCUMENT FOR DETAILS). Assignors: MAANINEN, TIINA J., MAANINEN, ARTO L. T., PIETIKAINEN, JARKKO J., RANTALA, JUHA T., TORMANEN, TEEMU T.
Waveguides are disclosed (and other devices and materials including but not limited to hydrophobic coatings, passivation materials, glob top materials, underfill materials, dielectric materials for IC and other applications, microlenses and any of a wide variety of optical devices) that benefit by a high hydrophobicity and high stability and, among other things. In one embodiment of the invention, a method for making a waveguide comprises: forming a lower cladding layer on a substrate; forming a core layer after the lower cladding layer; and forming an upper cladding layer after the core layer; wherein the lower cladding layer, core layer and/or upper cladding layer is hydrophobic and results, if exposed to water, in a water contact angle of 90 degrees or more. In this section, compounds are described that can be hydrolyzed and condensed (alone or with one or more other compounds) into a hydrophobic material having a molecular weight of from 500 to 10,000 (preferably from 500 to 5000, or more preferably 500 to 3000), which material can be deposited by spin-on, spray coating, dip coating, or the like. 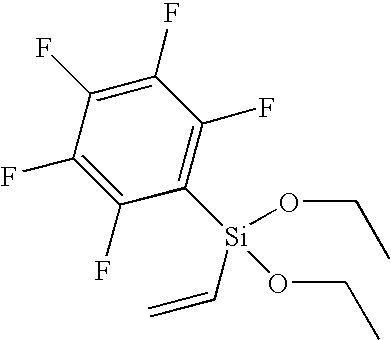 Such compounds are preferably partially or fully fluorinated, though not necessarily so. The compounds will preferably have an element M selected from groups 3-6 or 13-16 of the periodic table, which element is preferably tri-, tetra- or penta-valent, and more preferably tetravalent, such as those elements selected from group 14 of the periodic table. Connected to this element M are from three to five substituents, wherein from one to three of these substituents are organic groups to be discussed further below, with the remainder being a halogen or an alkoxy group. A compound is provided of the general formula: R 1MOR3 3, where R1 is any partially or fully fluorinated organic group (preferably a partially or fully fluorinated aryl, alkenyl, alkynyl or alkyl group), where M is an element selected from column 14 of the periodic table, and where OR3 is an alkoxy group—except where M is Si, R1 is perfluorinated phenyl or perfluorinated vinyl, and OR3 is ethoxy, which, though not novel per se, can be part of one of the novel methods for making the materials of the invention as will be discussed further below. R1 can have an inorganic component, though if so, a portion should preferably be a partially or fully fluorinated organic component. In a more preferred example of this, R1 comprises a double bond that is capable of physical alteration or degradation in the presence of an electron beam, or electromagnetic radiation and a photoinitiator (or sensitizer, photoacid or thermal initiator—to be discussed further below). In this example, R1 could be an alkenyl group such as a vinyl group, or could be an epoxy or acrylate group, that is preferably partially or fully fluorinated. Such a group, as will be discussed further herein, can allow for crosslinking upon application of an electron beam or preferably electromagnetic radiation (e.g. directing ultraviolet light through a mask with the material comprising a photoinitiator). In the alternative, R1 could be an organic group that is (or a hybrid organic-inorganic group that comprises) a single or multi ring structure (an “aryl group”) or an alkyl group of any length, such as from 1 to 14 carbon atoms or longer (preferably 4-10)—the alkyl group capable of being a straight or branched chain. If R1 is a ring structure, or a carbon chain of sufficient length (e.g. 4 (or 5) or more carbons), then such an R1 group can provide bulk to the final material once hydrolyzed, condensed and deposited on a substrate. 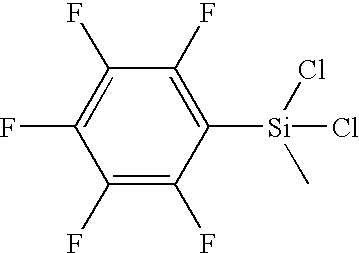 If R1 is a ring structure, whether single ring or multi ring, it can have substituents thereon, fluorinated, though not necessarily, such as alkyl or alkenyl substituents (preferably from 1 to 5 carbons), and where the substituents on the ring structure can be at from 1 to 3 locations around the ring. R1 can be a 4 to 8 sided ring structure (preferably 5 or 6 sided) which ring structure could comprise N or O. R1 could comprise nitrogen, or R1 can also have an oxygen component, such as a carboxylate group (e.g. acrylate, butenecarboxylate, propenecarboxylate, etc.). It should be noted that M in the compound formula examples above need not be tetravalent. M can also have other valencies, though preferably tri- or penta-valent. Examples would include early transition metals in group 3 or 5 of the periodic table (e.g. Y, V or Ta), or elements in columns 13 (column headed by B) or 15 (column headed by N), such as B, Al or As. In such situations, the compounds above would have one fewer or one additional alkoxy (OR 3), halogen (X) or an organic group (R1 or R2 independently from the other organic group(s)). Examples include R1MOR3X, R1MOR3 2, R1MX2, R1R2MX, R1R2MOR3, where M is a trivalent early transition metal (or similar examples with five substituents selected from R1 and/or R2 groups, as well as alkoxy and halogen groups for pentavalent elements (including metalloids or transition metals). 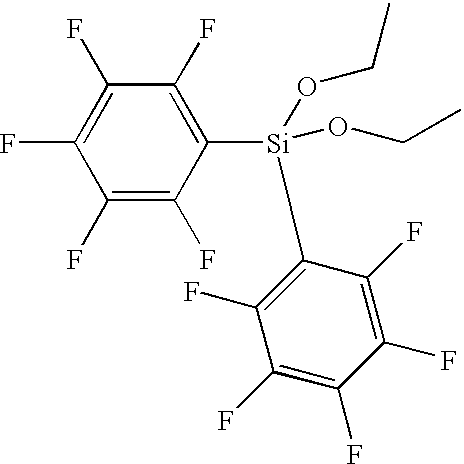 Such compounds could have the formula R13-mMOR3m, R15-mMOR3m, R2R14mMOR3m or R2R14-mMOR3m. 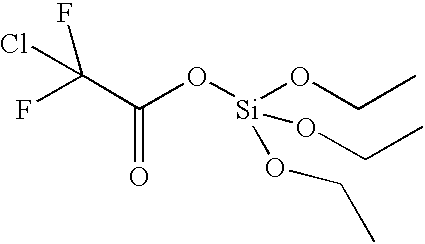 If such tri- or penta-valent elements are used, such a compound would preferably be hydrolyzed and condensed as a dopant, rather than as the main portion of the material at the time of hydrolysis and condensation (likewise with non-silicon tetravalent elements that form compounds in accordance with the tetravalent examples above, such as germanium compounds). In a number of the following examples of methods for making the materials of the invention, “M” is silicon, OR 3 is ethoxy, and X is Cl. However, as noted above, other alkoxy groups could easily be used (methoxy, propoxy, etc. 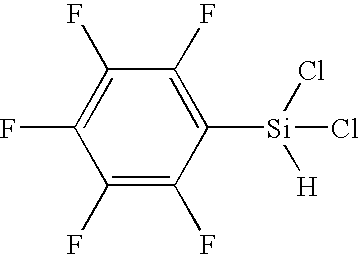 ), and other group 3-5 or 13-16 elements could be used in place of silicon and other halogens in place of chlorine. 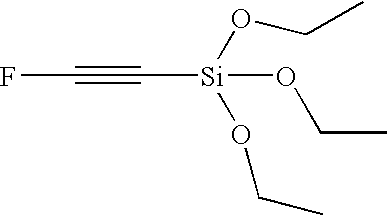 Starting materials can vary from tetraethoxy silane, to ethoxy silanes having one or more organic groups bound to the silicon, to chorosilanes having one or more chlorine groups and/or one or more organic groups, as well as starting materials having chlorine and alkoxy groups and with one or more organic groups. Any compound examples within Compounds I-IX above could be used as starting materials—or could be intermediate or final compounds as will be seen below. 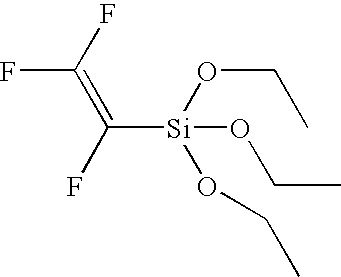 For example, trifluorovinyltriethoxysilane could be a final compound resulting from reacting a particular trifluorovinyl compound with tetraethoxysilane, or trifluorovinylsilane could be a starting material that, when reacted with a particular pentafluorophenyl compound, results in pentafluorophenyltrifluorovinyldiethoxysilane. 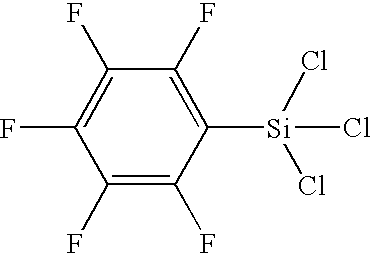 As mentioned above, it is also preferred that any organic groups that are part of the starting material or are “added” by chemical reaction to become part of the compound as set forth below, are partially or fully fluorinated (or fully or partially deuterated), though such is not necessary as will also be seen below. One example of a method for making the materials of the present invention comprises providing a compound R 1 4-qMOR3 q where M is selected from group 14 of the periodic table, OR3 is an alkoxy group, R1 is an alkyl, alkenyl, aryl or alkynyl, and q is from 2 to 4; reacting the compound R1 4-qMOR3 q with either a) Mg and R2X2 where X2 is Cl, Br or I and R2 is an alkyl, alkenyl, aryl or alkynyl group, or b) reacting with R2X1 where R2 is an alkyl, alkenyl, aryl or alkynyl group and wherein R2 is fully or partially fluorinated or deuterated and X1 is an element from group 1 of the periodic table; so as to replace one of the OR3 groups in R1 4-qMOR3 q so as to form R1 4-qR2MOR3 q-1. The starting material preferably has 1 or 2 (or no) organic groups (R 1) bound to the group 14 element “M”, which organic groups may or may not comprise fluorine, with the remaining groups bound to M being alkoxy groups. 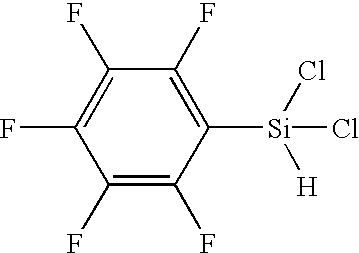 An additional preferably fluorinated (partially of fully) organic group becomes bound to the group 14 element by one of a number of reactions. One method (Method A) involves reacting the starting material with magnesium and a compound having the desired organic group (R2) bound to a halogen X2 (preferably Cl, Br or I)—namely R2 X2, which reaction replaces one of the alkoxy groups with the organic group R2. In the above example, a single alkoxy group is replaced, however, depending upon the molar ratios of starting material to R2X2 and Mg, more than one alkoxy group can be replaced with an R2 organic group. 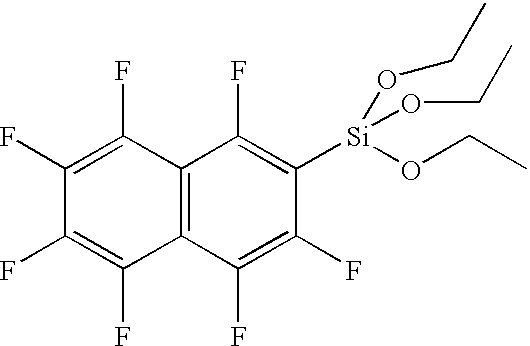 In one example of the above, a tetraethoxysilane, MOR3 4 is reacted with a compound R2X2 where R2 is a preferably fluorinated alkyl, aryl, alkenyl or alkynyl group and X2 is preferably Br or I, so as to form R2MOR3 3. In another example, R1MOR3 3 is reacted with R2X2 so as to form R1R2MOR3 2. This group of reactions can be referred to as: reacting the starting material R1 4-qMOR3 q with R2X2 where R2 is a preferably fluorinated alkyl, aryl, alkenyl or alkynyl group and X is preferably Br or I, so as to form R1 4-qR2MOR3 q-1. This method A can be described as a method comprising reacting a compound of the general formula R 1 4mMOR3 m, wherein m is an integer from 2 to 4, OR3 is an alkoxy, and M is an element selected from group 14 of the periodic table; with a compound of the general formula R2X2+Mg, wherein X2 is Br or I, where R1 and R2 are independently selected from alkyl, alkenyl, aryl or alkynyl, and wherein at least one of R1 and R2 is partially or fully fluorinated, so as to make a compound of the general formula R2MR1 3-nOR3 n, wherein n is an integer from 1 to 3. An alternate to the above method (Method B) is to react the same starting materials (R 1 4-qMOR3 q) with a compound R2X1 where, as above, R2 is an alkyl, alkenyl, aryl or alkynyl group and wherein R2 is fully or partially fluorinated or deuterated and X1 is an element from group 1 of the periodic table; so as to replace an OR3 group in R1 4-qMOR3 q to form R1 4-qR2MOR3 q-1. In this example, X1 is an element from group 1 of the periodic table, and is preferably Na, Li or K (more preferably Na or Li). In one example of the above, a tetraethoxysilane, MOR3 4 is reacted with a compound R2X1 where R2 is a preferably fluorinated alkyl, aryl, alkenyl or alkynyl group and X1 is preferably an element from group I of the periodic table, so as to form R2MOR3 3. In another example, R1MOR3 is reacted with R2X1 so as to form R1R2MOR3 2. This method B can be described as a method comprising reacting a compound of the general formula R1 4-mMOR3m wherein m is an integer from 2 to 4, R1 is selected from alkyl, alkenyl, aryl, or alkyl, alkenyl or aryl, and wherein R1 is nonfluorinated, or fully or partially fluorinated, OR3 is alkoxy, and M is an element selected from group 14 of the periodic table; with a compound of the general formula R2M1, wherein R2 is selected from alkyl, alkenyl, aryl, alkynyl, and wherein R2 is at least partially fluorinated; and M1 is an element from group I of the periodic table; so as to make a compound of the general formula R14-mMOR3m-1R2. A modification (Method C) of the aforementioned (Method B), is to react the starting material (R 1 4-qMOR3 q) with a halogen or halogen compound so as to replace one or more of the OR3 groups with a halogen group due to reaction with the halogen or halogen compound. The halogen or halogen compound can be any suitable material such as hydrobromic acid, thionylbromide, hydrochloric acid, chlorine, bromine, thionylchloride or sulfurylchloride and the like. Depending upon the ratio of halogen or halogen compound to starting material (and other parameters such as reaction time and/or temperature), one or more alkoxy groups can be replaced by a halogen group—though in most examples, a single alkoxy group or all alkoxy groups will be replaced. If a single alkoxy group is replaced, then the starting material R1 4-qMOR3 q becomes R1 4-qMOR3 qX3 where X3 is a halogen from the halogen or halogen compound reacted with the starting material (or simply begin with starting material R1 4-qMOR3 q-1X3). If all alkoxy groups are replaced due to the reaction with the halogen or halogen compound, then the starting material R1 4-qMOR3 q becomes R1 4-qMX3 q. Then, as mentioned for Method B above, either starting material R1 4-qMOR3 q-1X3 or R1 4-qMX3 q is reacted with a compound R2X1 where R2 is a preferably fluorinated alkyl, aryl, alkenyl or alkynyl group and X1 is preferably an element from group I of the periodic table, so as to form R1 4-qR2MOR3 q-1, R1 4-qR2MX3 q-1 (or even R1 4-qR2 2MX3 q-2 depending upon reaction conditions). A reaction with R1 4-qMOR3 q-1 X3 is preferred due to greater ease of control of the reaction. This Method C can be described as a method comprising reacting a compound of the general formula X3MOR3 3, where X3 is a halogen, M is an element selected from group 14 of the periodic table, and OR3 is alkoxy; with a compound of the general formula R1M1; where R1 is selected from alkyl, alkenyl, aryl and alkynyl and wherein R1 is partially or fully fluorinated; and M1 is an element from group I of the periodic table; so as to form a compound of the general formula R1MOR33. Related Methods B and C can be described as a single method comprising reacting a compound of the general formula R 1 4-mMOR3 m-nXn wherein m is an integer from 2 to 4, and n is an integer from 0 to 2, R1 is selected from alkyl, alkenyl, aryl, or alkyl, alkenyl or aryl, and wherein R1 is nonfluorinated, or fully or partially fluorinated; OR3 is alkoxy, and M is an element selected from group 14 of the periodic table; with a compound of the general formula R2M1, wherein R2 is selected from alkyl, alkenyl, aryl, alkynyl, and wherein R2 is at least partially fluorinated, and M1 is an element from group I of the periodic table; so as to make a compound of the general formula R2MR14-mOR3m-nXn-1. 200 ml of freshly distilled dry Et 2O is added to a 500 ml vessel (under an argon atmosphere). The vessel is cooled down to −80° C. and 15 g (0.129 mol) of CF2═CFCl gas is bubbled to Et2O. 100 ml (0.13 mol) of sec-BuLi is added dropwise during three hours. The temperature of the solution is kept below −60° C. all the time. The solution is stirred for 15 minutes and 29 ml (27.08 g, 0.130 mol) of Si(OEt)4 is added in small portions. The solution is stirred for over night allowing it to warm up to room temperature. 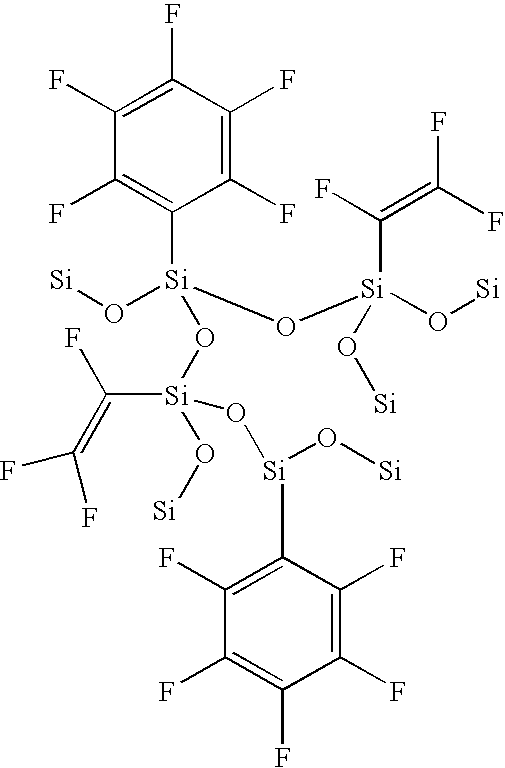 Formed red solution is filtered and evaporated to dryness to result crude trifluorovinyltriethoxysilane, CF2═CFSi(OEt)3. CF 2═CFSi(OEt)3 is also formed when 30.80 g (0.155 mol) ClSi(OEt)3 in Et2O is slowly added to solution of CF2═CF—Li (0.155 mol, 13.633 g, prepared in situ) in Et2O at −78° C. Reaction mixture is stirred overnight allowing it slowly warm to room temperature. LiCl is removed by filtration and solution evaporated to dryness to result yellow liquid, crude trifluorovinyltriethoxysilane. 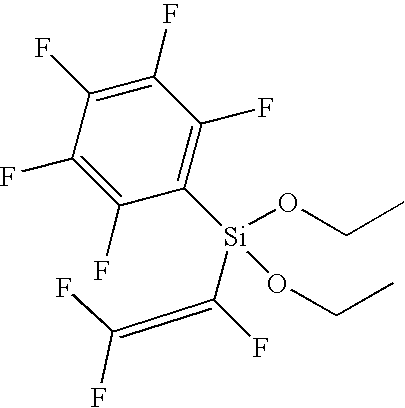 12.1 g (0.0328 mol) pentafluorophenyltrifluorovinyldiethoxysilane, 12 mL (0.1638 mol, 19.487 g) thionylchloride and 0.50 g (0.0043 mol) pyridinium hydrochloride are refluxed and stirred for 24 h. Excess of SOCl 2 is evaporated and residue is fractionally distilled under reduced pressure to yield a mixture of 80% pentafluorophenyltrifluorovinyldichlorosilane. 50 g (0.133 mol) pentafluorophenyltriethoxygermane, 58 mL (0.80 mol, 95.2 g) thionylchloride and 1.97 g (0.017 mol) pyridinium hydrochloride are refluxed and stirred for 24 h. Excess of SOCl 2 is evaporated and pentafluorophenyltrichlorogermane isolated by vacuum distillation. 100 g (0.240 mol) perfluoronaphthalenetriethoxysilane, 105.2 mL (1.442 mol, 171.55 g) thionylchloride and 3.54 g (0.0306 mol) pyridinium hydrochloride are refluxed and stirred for 24 h. Excess of SOCl 2 is evaporated and perfluoronaphthalenetrichlorosilane isolated by vacuum distillation. 81.68 g (0.300 mol) methyl(pentafluorophenyl)dimethoxysilane, 109 mL (1.50 mol, 178.4 g) thionylchloride and 3.69 g (0.0319 mol) pyridinium hydrochloride are refluxed and stirred for 16 h. Excess of SOCl 2 is evaporated and methyl(pentafluorophenyl)dichlorosilane isolated by vacuum-distillation. 265.2 mL (1.95 mol, 525.353 g) bromopentafluorobenzene, 52.11 g (2.144 mol) magnesium powder and 216 mL (0.975 mol, 203.025 g) tetraethoxysilane are mixed together at room temperature and diethylether is added dropwise to the vigorously stirred solution until an exothermic reaction is observed (˜240 mL). The solution is stirred for 30 minutes after which additional 90 mL of Et 2O is carefully added. After stirring at 35° C. for 16 h the mixture is cooled to room temperature and diethylether evaporated. An excess of n-heptane (˜600 mL) is added to precipitate the magnesium salts. Solution is filtrated and evaporated to dryness. 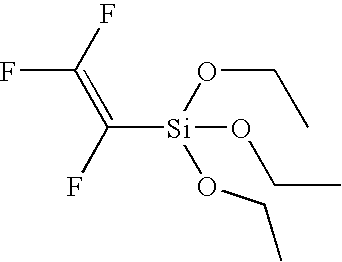 The residue is fractionally distilled under reduced pressure to yield di(pentafluorophenyl)diethoxysilane. 39.52 g (0.195 mol) chloropentafluorobenzene is weighed to a 1000 mL vessel and 250 mL Et 2O is added. The vessel is cooled down to −70° C. and 150 mL (0.195 mol) of sec-BuLi (1.3 M) is added dropwise during one hour. The temperature of the solution is kept below −50° C. all the time. The solution is stirred for 30 minutes and 62.54 g (0.195 mol) of diethoxychloropentafluorophenylsilane in Et2O (100 mL) is added in small portions. The solution is stirred for over night allowing it to warm up to room temperature. 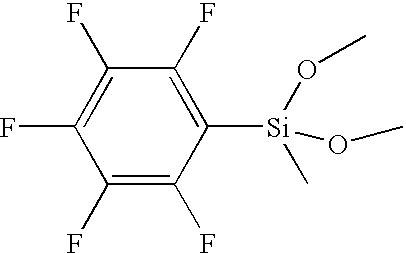 Formed clear solution is filtered and evaporated to dryness to result di(pentafluorophenyl)diethoxysilane, (C6F5)2Si(OEt)2. 180.93 g (0.400 mol) di(pentafluorophenyl)diethoxysilane, 146 mL (2.00 mol, 237.9 g) thionylchloride and 4.92 g (0.0426 mol) pyridinium hydrochloride are refluxed and stirred for 16 h. Excess of SOCl 2 is evaporated and di(pentafluorophenyl)dichlorosilane isolated by vacuum-distillation. 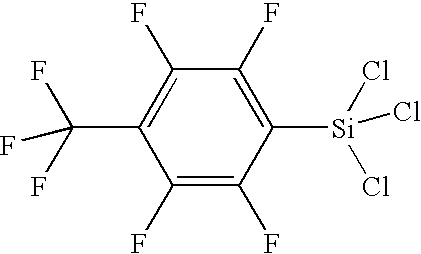 600.0 mL (0.300 mol) pentafluorophenyl magnesiumbromide (0.5 M sol. in Et 2O) is added dropwise to a solution of 30.3 mL (0.300 mol, 40.635 g) HSiCl3 in Et2O at −70° C. Reaction mixture is allowed to warm slowly to room temperature by stirring overnight. Diethylether is evaporated and an excess of n-heptane (˜200 mL) is added to precipitate the magnesium salts. Solution is filtrated and evaporated to dryness. 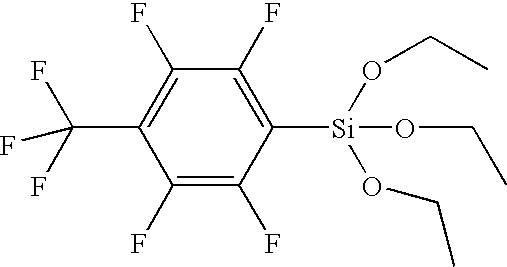 The residue, pentafluorophenyldichlorosilane, is purified by fractional distillation. 79.49 g (0.400 mol) ClSi(OEt) 3 in Et2O is slowly added to a slurry of CH≡C—Na (0.400 mol, 19.208 g) in Xylene/light mineral oil at −78° C. Reaction mixture is stirred overnight allowing it slowly warm to room temperature. NaCl is removed by filtration and solution evaporated to dryness to result acetylenetriethoxysilane. 100 mL (0.8021 mol, 198.088 g) pentafluorobromobenzene, 24.90 g (1.024 mol) magnesium powder and 670 mL (3.2084 mol, 610.623 g) vinyltriethoxysilane are mixed together at room temperature and Et 2O is added dropwise to the vigorously stirred solution until an exothermic reaction is observed (˜400 mL). After stirring at 35° C. for 16 h the mixture is cooled to room temperature and diethylether evaporated. An excess of n-heptane (˜500 mL) is added to precipitate the magnesium salts. Solution is filtrated and evaporated to dryness. 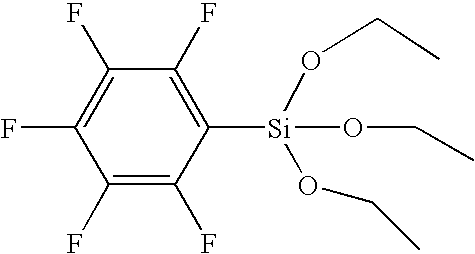 The residue is fractionally distilled under reduced pressure to yield pentafluorophenylvinyldiethoxysilane. 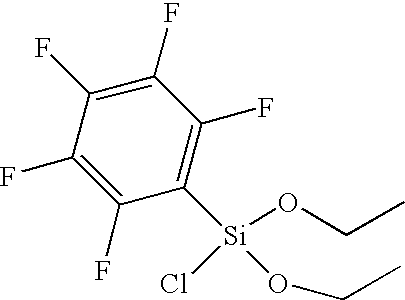 183.11 g (0.300 mol) 1H,1H,2H,2H-Perfluorodecyltriethoxysilane, 22 mL (0.300 mol, 35.69 g) thionylchloride and 4.51 g (0.039 mol) pyridinium hydrochloride are refluxed and stirred for 16 h. Excess of SOCl 2 is evaporated and 1H,1H,2H,2H-Perfluorodecylchlorodi(ethoxy)silane isolated by vacuum-distillation. 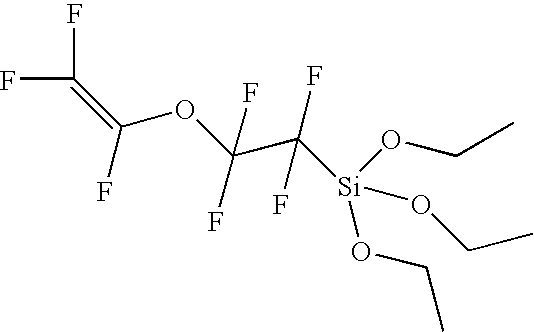 Follow the steps in Example 23, then 174.7 g (0.300 mol) perfluorooctyltriethoxysilane, 131 mL (1.800 mol, 214.1 g) thionylchloride and 4.51 g (0.039 mol) pyridinium hydrochloride are refluxed and stirred for 16 h. Excess of SOCl 2 is evaporated and perfluorooctyltrichlorosilane isolated by vacuum-distillation. 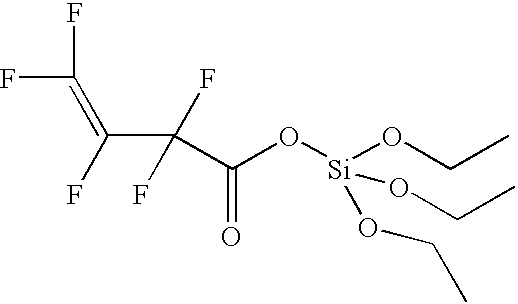 108.1 g (0.300 mol) tetrafluoroethyl trifluorovinyl ether triethoxysilane, 131 mL (1.800 mol, 214.1 g) thionylchloride and 4.51 g (0.039 mol) pyridinium hydrochloride are refluxed and stirred for 16 h. Excess of SOCl 2 is evaporated and tetrafluoroethyl trifluorovinyl ether trichlorosilane is isolated by vacuum-distillation. 30.80 g (0.155 mol) ClSi(OEt) 3 in Et2O is slowly added to solution of CF≡C—Li (0.155 mol, 7.744 g, prepared in situ) in Et2O at −78° C. Reaction mixture is stirred overnight allowing it slowly warm to room temperature. 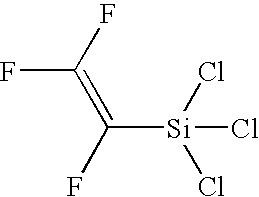 LiCl is removed by filtration and solution evaporated to dryness to result fluoroacetylenetriethoxysilane. 180.93 g (0.400 mol) di(pentafluorophenyl)diethoxysilane, 29 mL (0.400 mol, 47.6 g) thionylchloride and 4.92 g (0.0426 mol) pyridinium hydrochloride are refluxed and stirred for 16 h. Unreacted SOCl 2 is evaporated and di(pentafluorophenyl)chloroethoxysilane isolated by vacuum distillation. 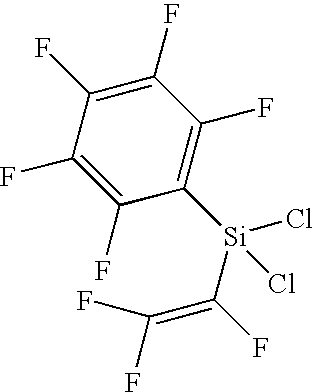 88.54 g (0.200 mol) of di(pentafluorophenyl)chloroethoxysilane in Et 2O is slowly added to solution of C6F5-Li (0.200 mol, 34.80 g, prepared in situ) in Et2O at −78° C. The solution is stirred for over night allowing it to warm up to room temperature. 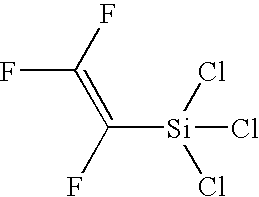 Formed clear solution is filtered and evaporated to dryness to result tri(pentafluorophenyl)ethoxysilane, (C6F5)3SiOEt. 114.86 g (0.200 mol) tri(pentafluorophenyl)ethoxysilane, 14.6 mL (0.200 mol, 23.8 g) thionylchloride and 2.46 g (0.0213 mol) pyridinium hydrochloride are refluxed and stirred for 16 h. Unreacted SOCl 2 is evaporated and tri(pentafluorophenyl)chlorosilane isolated by vacuum-distillation. In addition to altering the organic groups in the above examples, it is of course also possible to use other reagents in the methods above. 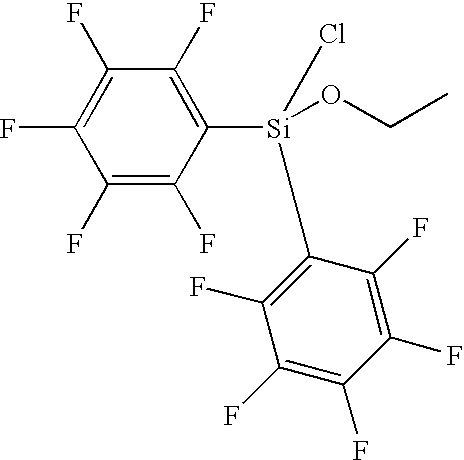 For example, in place of diethyl ether, other solvents such as THF could be used. In place of n-heptane (in Method A) other non polar solvents such as n-hexane could be used. And in place of thionyl chloride (for replacing one or more alkoxy groups with a halogen), chlorine, hydrochloric acid, hydrobromic acid, thionylbromide, chlorine or sulfurylchloride could be used. Also, the temperatures and times (and other process parameters) can be varied as desired. In one example, it is preferred that the molar ratio of the starting material to R 2X1 (Methods B or C) is 0.5:1 to 2:1—preferably 1:1. Also, the starting material and R2X1 are preferably mixed at a temperature less than 40C degrees, e.g. between −50C and −10° C. and warmed to a higher temperature over a period of four hours or more (this higher temperature can be room temperature or higher if desired)—or over a longer period of time such as overnight. As can be seen from the examples above, Methods B and C involve reacting a first compound (having an M group selected from group 14 of the periodic table, 0, 1 or 2 organic groups bound to M) with a second compound (having an element from group 1 of the periodic table and a “new” organic group). As can also be seen from the above, such a reaction can take place if the first compound has alkoxy groups bound to M or both alkoxy and halogen groups (0, 1 or 2 halogen groups) bound to M. Method C, as mentioned earlier, is a variation of Method B—and both methods can be viewed as comprising: reacting a compound of the general formula R 1 4-mMOR3 m-nXn, where R1 is any nonfluorinated (including deuterated) or partially or fully fluorinated organic group (preferably a partially or fully fluorinated aryl, alkenyl, alkynyl or alkyl group) as set forth above, where M is selected from group 14 of the periodic table, where X is a halogen, where OR3 is an alkoxy group, where m=2 to 4 and n=0 to 2. R1 4-mMOR3 m-nXn is reacted with R2X1 where R2 is selected from alkyl, alkenyl, aryl or alkynyl (and where R2 is fluorinated (fully or partially), and where X1 is an element from group 1 of the periodic table. X1 is preferably Na, Li or K, more preferably Na or Li, and most preferably Li. M is preferably Si, Ge or Sn, more preferably Si or Ge, and most preferably Si. X is preferably Cl, Br or I, more preferably Cl or Br, and most preferably Cl. OR3 is preferably an alkoxy group having from 1 to 4 carbon atoms, more preferably from 1 to 3 carbons, and most preferably 2 carbons (ethoxy). Also, “m” is preferably 3 or 4, whereas “n” is preferably 0 or 1. R 1 and R2 are independently preferably partially or fully fluorinated (though not necessarily as can be seen in prior examples) organic groups such as an aryl group (by aryl group we mean any organic group having a ring structure) though preferably a five or six carbon ring that is unsubstituted or substituted. For a six carbon ring structure, 1, 2 or 3 substituents can be bound to the ring, which substituents can be actively bound to the ring via a variation on the Method C set forth above (to be described further below). The substituents can be alkyl groups of any desired length, straight or branched chain, preferably fluorinated, and preferably having from 1 to 4 carbon atoms. Or the substituents on the ring structure can comprise a C═C double bond and be an alkenyl group (by alkenyl group we mean any organic group with a C═C double bond) such as an acrylate, vinyl or allyl group. 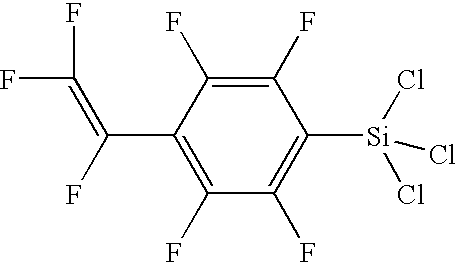 A fluorinated vinyl, methyl or ethyl group on a fluorinated phenyl group are examples. Or, the aryl group could be a multi ring structure (e.g. 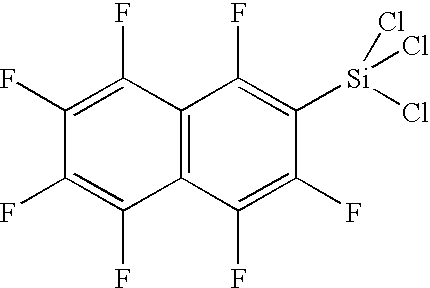 perfluoronaphthalene or a biphenyl group). Or R1 and R2 could independently be an alkenyl group such as a vinyl or longer chain group having a C═C double bond, or a group having other types of double bonds (e.g C═O double bonds or both C═C and C═O double bonds) such as acrylate and methacrylate groups. R1 and R2 could also be an alkynyl group (by alkynyl group we mean any organic group with a carbon-carbon triple bond) as mentioned previously, as well as an alkyl group. If an alkyl group (by alkyl group we mean a carbon chain of any length), preferably the carbon chain is from 1 to 14, and more preferably from 4 to 8. 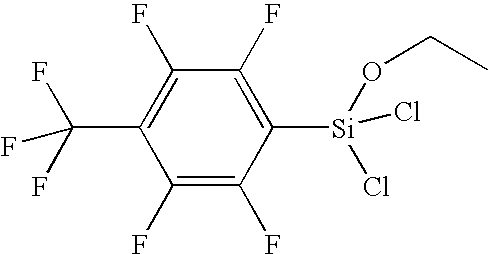 Perfluorinated alkyl groups from 1 to 8 carbons can be used, as well as fluorinated (e.g. partially fluorinated) groups longer than 8 carbons. 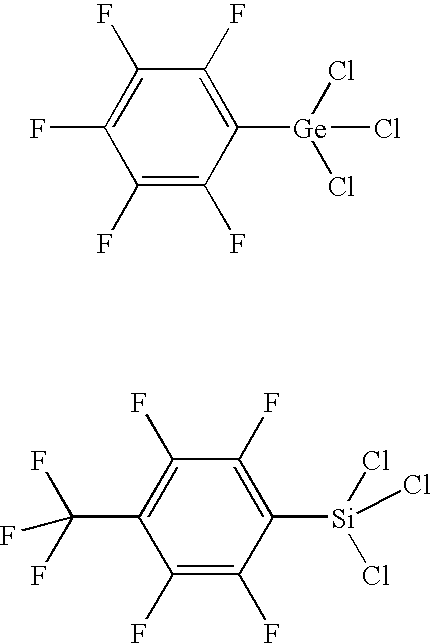 All the organic groups above could be deuterated in stead of fluorinated (or partially deuterated and partially fluorinated), though fully or partially fluorinated (particularly fully fluorinated) is preferred. In Method C set forth above, an organic (or hybrid) group “R” (e.g. R2) becomes bound to a group 3-6 or 13-16 element “M” by replacing a halogen “X” bound to “M” via the specified reaction. In an alternative to this method (Method D), an organic (or hybrid) group “R” (e.g. R1) comprises the halogen “X”—preferably Cl or Br (rather than “X” being bound to “M”). Thus when the reaction is performed, R2 replaces X bound to R1, such that R2 becomes bound to R1 (which is in turn bound to M). Preferably the other groups bound to M are alkoxy groups (OR3) or other organic groups. More particularly, such a method comprises providing a compound X aR1MOR3 2R4 where a is from 1 to 3, X is a halogen(s) bound to R1, R1 is an organic group (preferably an aryl, alkyl, alkenyl or alkynyl—more preferably an alkyl or aryl group), OR3 is an alkoxy, and R4 is either an additional alkoxy group or an additional organic group (selected from aryl, alkyl, alkenyl or alkynyl), and reacting this compound with R2M1 where M1 is selected from group 1 of the periodic table and R2 is an organic group preferably selected from aryl, alkyl, alkenyl and alkynyl, etc., so as to form R2 aR1MOR3 2R4. In one example, R 4 is an alkoxy group the same as OR3, such that the method comprises reacting XaR1MOR3 3 with R2M1 to form R2 aR1MOR3 3 (where R1 and OR3 are bound to M and R2 is bound to R1. In another example, R4 is an organic group selected from aryl, alkyl, alkenyl and alkynyl. Preferably OR3 is a methoxy, ethoxy or propoxy, R1 is an aryl or alkyl (straight or branched chain) having from 1 to 14 carbons, and R2 is an aryl, alkyl, alkenyl or alkynyl, where a=1 or 2 if R1 is an alkyl and a=1, 2 or 3 if R1 is an aryl group. R2 can be an epoxy, acrylate, methacrylate, vinyl, allyl or other group capable of cross linking when exposed to an electron beam or in the presence of a photoinitiator and electromagnetic energy (e.g. UV light). 78.246 g (0.200 mol) 4-bromotetrafluorophenyltriethoxysilane in Et 2O is slowly added to solution of CF2═CF−Li (0.200 mol, 17.592 g, prepared in situ) in Et2O at −78° C. Reaction mixture is stirred overnight while it will slowly warm to room temperature. LiBr is removed by filtration and the product, 4-triethoxysilylperfluorostyrene, purified by distillation. 117.704 g (0.300 mol) 4-triethoxysilylperfluorostyrene, 131 mL (1.800 mol, 214.1 g) thionylchloride and 4.51 g (0.039 mol) pyridinium hydrochloride were refluxed and stirred for 16 h. Excess of SOCl 2 was evaporated and 4-trichlorosilyl-perfluorostyrene isolated by vacuum-distillation. 15.246 g (0.10 mol) sodium chlorodifluoroacetate, is dissolved to 100 mL Et 2O and cooled to −70° C. 19.7 mL (0.10 mol, 19.872 g) chlorotriethoxysilane in Et2O (50 mL) was added dropwise to reaction solution. The solution was stirred for over night allowing it to warm up to room temperature. NaCl is removed by filtration and solution evaporated to dryness to result clear colourless liquid, chlorodifluoroacetic acid, triethoxysilyl ester. 29.27 g (0.10 mol) chlorodifluoroacetic acid, triethoxysilyl ester, is dissolved to 100 mL Et 2O and slowly added to solution of CF2═CF—Li (0.10 mol, 8.796 g, prepared in situ) in Et2O at −78° C. Reaction mixture is stirred overnight allowing it slowly warm to room temperature. LiCl is removed by filtration and solution evaporated to dryness to result yellow liquid, crude perfluoro-3-butene acid, triethoxysilyl ester. 143.516 g (0.300 mol) perfluorobiphenyltriethoxysilane, 131 mL (1.800 mol, 214.1 g) thionylchloride and 4.51 g (0.039 mol) pyridinium hydrochloride were refluxed and stirred for 16 h. Excess of SOCl 2 was evaporated and perfluorobiphenyltrichlorosilane isolated by vacuum-distillation. 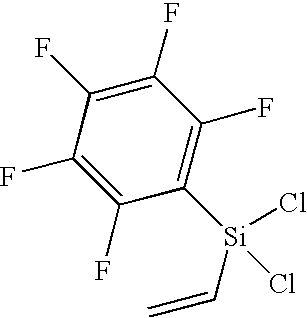 88.641 g (0.200 mol) 4-bromooctafluorobutanetriethoxysilane in Et 2O is slowly added to solution of CF2═CF—Li (0.200 mol, 17.592 g, prepared in situ) in Et2O at −78° C. Reaction mixture is stirred overnight while it will slowly warm to room temperature. LiBr is removed by filtration and the product, perfluoro-1-hexenetriethoxysilane, purified by distillation. 133.295 g (0.300 mol) perfluoro-1-hexenetriethoxysilane, 131 mL (1.800 mol, 214.1 g) thionylchloride and 4.51 g (0.039 mol) pyridinium hydrochloride were refluxed and stirred for 16 h. Excess of SOCl 2 was evaporated and perfluoro-1-hexenetrichlorosilane isolated by vacuum-distillation. In the above “Method D” examples, R 1, R2, R3 and R4 are preferably partially or fully fluorinated. Hydrolysis. The reaction mixture is cooled to 0° C. The hydrolysis is performed by adding water (H 2O) into the reaction mixture. The water is added in 1:4 (volume/volume) water-tetrahydrofuran-solution. Water is used equimolar amount as there are chlorine atoms in the starting reagents. The reaction mixture is held at 0° C. temperature during the addition. The reaction mixture is stirred at room temperature for 1 hour after addition. 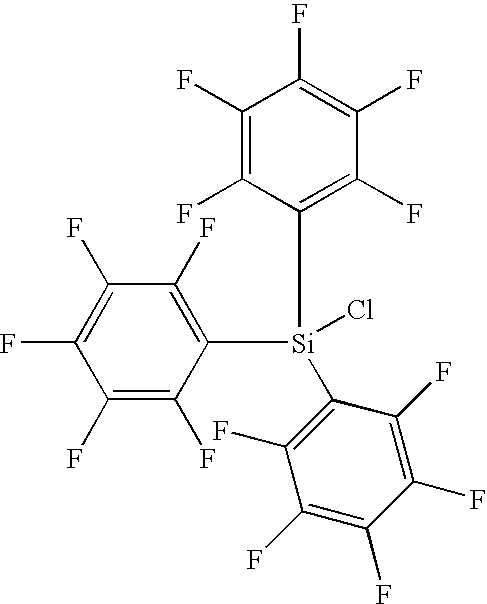 Instead of tetrahydrofuran, water can be dissolved into pure or mixture of following solvents: acetone, chloroform, diethyl ether, ethyl acetate, methyl-isobutyl ketone, methyl ethyl ketone, acetonitrile, ethylene glycol dimethyl ether, triethylamine, formic acid, nitromethane, 1,4-dioxan, pyridine, acetic acid. In the place of water (H2O) can be used: deuterium oxide (D2O) or HDO. A part of the water can be replaced with alcohols, deuterium alcohols, fluorinated alcohols, chlorinated alcohols, fluorinated deuterated alcohols, and/or chlorinated deuterated alcohols. The reaction mixture may be adjusted to any appropriate temperature. Excess of water can be used. Some level co-condensation can happen during the hydrolysis that can be seen as increment of material molecular mass. Neutralization. The reaction mixture is neutralized with pure sodium hydrogen carbonate. NaHCO 3 is added into cooled reaction mixture at 0° C. temperature (NaHCO3 is added equimolar amount as there is hydrochloric acid in the reaction mixture). The mixture is stirred at the room temperature for a while. After the pH of the reaction mixture has reached value 7, the mixture is filtered. The solvent is then evaporated with rotary evaporator (p=250−50 mbar, t(bath)=+30° C.). Instead of NaHCO 3 can be used pure potassium hydrogen carbonate (KHCO3), sodium carbonate (Na2CO3), potassium carbonate (K2CO3), sodium hydroxide (NaOH), potassium hydroxide (KOH), calcium hydroxide (Ca(OH)2), magnesium hydroxide (Mg(OH)2) ammonia (NH3), trialkylamines (R3N, where R is hydrogen or straight/branched chain CxHy, x<10, for example triethanolamine), trialkyl ammonium hydroxides (R3NOH, R3N, where R is hydrogen or straight/branched chain CxHy, x<10). All neutralization reagents can be added into the reaction mixture also as a solution of any appropriate solvent. Neutralization can be performed also with solvent-solvent—extraction or with azeotropic water evaporation. Procedure for solvent-solvent-extraction: The solvent is evaporated off after the hydrolysis. The material is dissolved into pure or mixture of solvents such as: chloroform, ethyl acetate, diethyl ether, di-isopropyl ether, dichloromethane, methyl-isobutyl ketone, toluene, carbon disulphide, carbon tetrachloride, benzene, nitromethane, mehylcyclohexane, or chlorobenzene. The solution is extracted several times with water or D 2O until the pH of the organic layer is over value 6. The solvent is then evaporated with rotary evaporator (p=250−50 mbar, t(bath)=+30° C.). dissolved in Et 2O at −80° C. After the addition is complete the reaction mixture is stirred for 15 min to yield lithiumtrifluoroethylene. The above is but one example of a method comprising: reacting a compound of the general formula R1MX3 3 with a compound of the general formula R2MX33 where R1 is selected from alkyl, alkenyl, aryl and alkynyl, R2 is selected from alkenyl, aryl or alkynyl, M is an element selected from groups 3-6 or 13-16 though preferably from group 14 of the periodic table, and X3 is a halogen; with H2O or D2O; so as to form a compound having a molecular weight of from 500 to 10,000 with a -M-O-M-O— backbone with R1 and R2 substituents on each M. In the hydrolysis example above, silicon atoms of the network are modified by pentafluorophenyl and trifluorovinyl groups in an approximate ratio 1:1. Of course other ratios are possible depending upon the ratio of starting materials, and, of course, other three dimensional networks can be achieved by having other (or additional) starting materials selected from Compound IV, VII and IX, along with other hydrolyzable materials. An alternate example is a method comprising: reacting a compound of the general formula R1R2MX32 where R1 is selected from alkyl, alkenyl, aryl and alkynyl, R2 is selected from alkenyl, aryl or alkynyl, M is an element selected from group 14 of the periodic table, and X3 is a halogen; with D2O; so as to form a compound having a molecular weight of from 500 to 10,000 with a -M-O-M-O— backbone with R1 and R2 substituents on each M. As mentioned above, Compounds IV, VII and IX have organic (or hybrid) R group(s) and halogen(s) (preferably Br or Cl) bound to M (selected from groups 3-6 or 13-16—preferably group 14)) and can be combined in almost limitless combinations—e.g. a compound selected from the Compound IV group could be hydrolyzed with another compound selected from Compound IV. In another example, a single compound from Compound VII is hydrolyzed. Many other combinations are possible, including: Compound IV+Compound VII; Compound IV+Compound IV+Compound IV; Compound VII+Compound VII; Compound IV+Compound VII+Compound IX; Compound IV+Compound IV+Compound IX; Compound VII+Compound IX, etc.—which various combinations of compounds will result in a hydrolyzed material having at least one organic substituent bound to an inorganic oxide backbone—preferably from 2 to 6 different organic substituents bound to the backbone prior to deposition and exposure. The presence of the organic groups, preferably all fluorinated, allows for improved optical absorption characteristics due to minimal or absent C—H bonds in the deposited material (preferably the hydrolyzed/condensed material has a hydrogen content of 10% or less, preferably 5% or less, and more preferably 1% or less). More particularly, as can be seen in FIG. 3A, a substrate  10 is provided, on which is deposited a lower cladding layer 12 (FIG. 3B). A buffer layer could be deposited prior to depositing the lower cladding layer, depending in part on the thickness of the lower cladding layer that is deposited. After depositing the lower cladding layer, a core layer 14 is deposited (FIG. 3C). Core layer 14 preferably has a different refractive index than the lower cladding layer. Core layer 14 is then patterned, preferably by exposure to light (preferably UV light) via a mask 20 (FIG. 3D). Areas that are exposed to light undergo cross linking and hardening. As can be seen in FIG. 3E, application of a developer allows for removal of unexposed areas, with exposed areas 141 of the core layer remaining (now the core). Baking/annealing can be used to stabilize the remaining areas of the core layer. As can be seen in FIG. 3F, an upper cladding layer 16 is deposited, followed by a final hard bake. Preferably upper cladding layer 16 has a different refractive index than core 141, which refractive index can be the same as that of the lower cladding layer 12. A cross section photograph of a patterned core, in accordance with the method of FIGS. 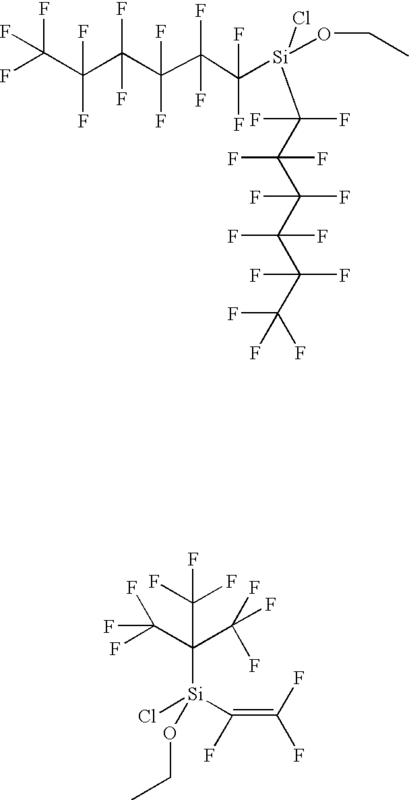 3A to 3F, is illustrated in FIG. 5. An alternate process for forming a waveguide is illustrated in FIG. 4A, a substrate  30 is provided, upon which is deposited a lower cladding layer 32 (FIG. 4B). As above, a buffer layer could also be provided, prior to depositing the lower cladding layer, if desired. The substrate and any layers thereon can be heated to stabilize the deposited layer(s). As can be seen in FIG. 4C, a core layer 34 is provided preferably having a refractive index different than the refractive index of the lower cladding layer. Then, as can be seen in FIG. 4D, a photoresist layer 36 (e.g. positive tone) is deposited (preferably by spin-on), followed by a pre-bake. Then, the photoresist is exposed to electromagnetic radiation in FIG. 4E (e.g. UV light—wavelength depending upon the type of photoresist selected), and exposed to a developer (FIG. 4F) to remove exposed areas of resist, leaving behind unexposed resist areas 36 1. Then, core layer 34 is etched, such as by reactive ion etching, so as to remove areas of core layer not protected by resist areas 36 1—leaving behind core layer portion 34 1. Finally, resist portions 36 1 are removed, and, as illustrated in FIG. 4H, an upper cladding layer 38 is deposited, followed by heating of the thus formed waveguide. Any of the cladding layers and core layer (as well as buffer layer if included) can be formed of the hydrophobic material of the invention. Of course, the cladding layers preferably have a different refractive index than the core, which refractive index can be achieved by modifying the inorganic backbone and/or the organic groups bound thereto, as mentioned elsewhere herein. Other adhesion promoting materials that could be used include Onichem organosilane G602, (N (beta aminoethyl)-gamma aminopropyl dimethyl siloxane (CA 3069-29-2)—high boiling, high R 1(1.454), thermally stable low density and is compatible with acrylics, silicones, epoxies, and phenolics), or Dow AP8000, propyloxysilane (e.g. 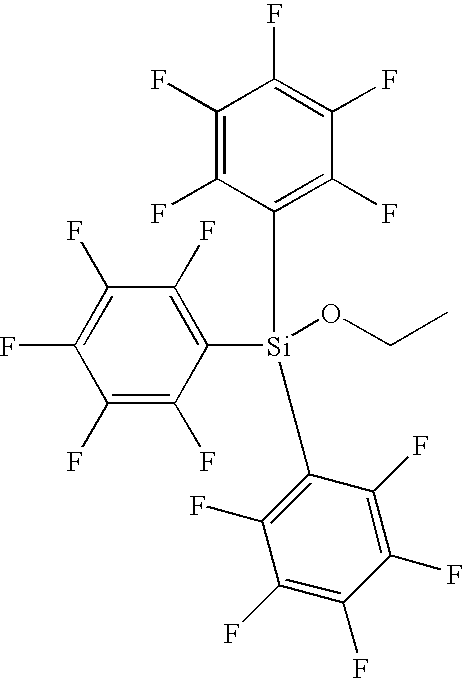 3(2 3 epoxy propoxy propyl) trimethoxy silane), Ormocer (low viscosity), Halar, Orion/Dupont Teflon primer, trifluoroacetic acid, barium acetate, fluorethers (from Cytonix), PFC FSM 660 (a fluoroalkyl monosilane in a fluorinated solvent)—can be diluted to 0.1 to 0.05 percent in alcohol or fluorinated solvent, PFC FSM 1770 (a tri-fluoroalkyl monosilane in a fluorinated solvent, providing very low surface energy to oxide surfaces and good adhesion for fluoropolymers)—can be diluted to 0.1 to 0.05 percent in alcohol or fluorinated solvent, and/or HMDS. wherein the lower cladding layer, core layer and/or upper cladding layer is hydrophobic and results, if exposed to water, in a water contact angle of 90 degrees or more. 2. The method of claim 1, wherein the material of the hydrophobic layer is a hybrid organic-inorganic material. 3. The method of claim 1, wherein the hydrophobic layer material is deposited at a temperature of 200 C or less. 4. The method of claim 3, wherein the hydrophobic layer material is annealed after depositing, wherein the annealing is at a temperature of 200C or less. 5. The method of claim 3, wherein the hydrophobic layer material is deposited at a temperature of 150 C or less. 6. The method of claim 1, wherein the substrate is an integrated circuit substrate. 7. The method of claim 1, wherein the substrate is a glass, quartz, semiconductor, ceramic or plastic substrate. 8. The method of claim 7, wherein the substrate is a glass or quartz substrate. 9. The method of claim 7, wherein the substrate is a semiconductor substrate. 10. 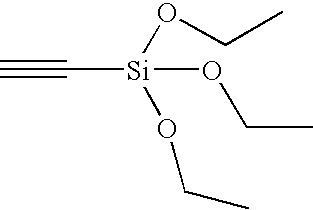 The method of claim 9, wherein the substrate is a silicon or germanium substrate. 11. The method of claim 7, wherein the substrate comprises photonic and/or electronic circuitry thereon. 12. The method of claim 11, wherein the circuitry is formed on the substrate prior to depositing the lower cladding layer. 13. The method of claim 1, wherein the substrate is a printed circuit board. 14. The method of claim 1, wherein the hydrophobic layer has an optical loss of less than 0.1 dB/cm at 1550 nm. 15. The method of claim 14, wherein the hydrophobic layer has an optical loss of less than 0.09 dB/cm at 1550 nm. 16. The method of claim 15, wherein the hydrophobic layer has an optical loss of less than 0.075 dB/cm at 1550 nm. 18. The method of claim 1, wherein the hydrophobic layer has an optical loss of less than 0.1 dB/cm at C Band. 19. The method of claim 1, wherein the hydrophobic layer has an optical loss of less than 0.1 dB/cm at L Band. 20. The method of claim 16, wherein the hydrophobic layer has an optical loss of less than 0.05 dB/cm at 1550 nm. 21. The method of claim 17, wherein the hydrophobic layer has an optical loss of less than 0.075 dB/cm at 1310 nm. 22. The method of claim 18, wherein the hydrophobic layer has an optical loss of less than 0.075 dB/cm at C Band. 23. The method of claim 19, wherein the hydrophobic layer has an optical loss of less than 0.075 dB/cm at L Band. 24. The method of claim 1, wherein the deposited hydrophobic layer material is capable of being heated in supercritical water vapor at 2 atm and at 120 C for 2 hours after which optical absorption, polarization dependent loss and/or refractive index change remains unchanged ±5%. 25. The method of claim 1, wherein the hydrophobic layer material has a birefringence of less than 5×10e-5. 26. The method of claim 25, wherein the hydrophobic layer material has a birefringence of less than 2×10e-5. 27. The method of claim 26, wherein the hydrophobic layer material has a birefringence of less than 1×10e-6. 28. The method of claim 1, wherein the hydrophobic layer material is directly patterned to have a surface topography where the aspect ratio is at least 2:1. 29. The method of claim 28, wherein the hydrophobic layer material is directly patterned to have a surface topography where the aspect ratio is at least 3:1. 30. The method of claim 29, wherein the deposited hydrophobic layer material is directly patterned to have a surface topography where the aspect ratio is at least 10:1. 31. The method of claim 1, wherein the deposited hydrophobic layer material is deposited at a rate of 100 um/min or more. 32. The method of claim 1, wherein the deposited hydrophobic layer material has a thickness of from 1 nm to 100 um after a single deposition step. 33. The method of claim 32, wherein the deposited hydrophobic layer material has a thickness of from 0.5 um to 50 um after a single deposition step. 34. The method of claim 1, wherein the deposited hydrophobic layer material has a thickness of from 1 um to 20 um after a single deposition step. 35. The method of claim 1, wherein the hydrophobic layer material has a polarization dependent loss of 0.1 dB/cm or less. 36. The method of claim 35, wherein the deposited hydrophobic layer material has a polarization dependent loss of 0.05 dB/cm or less. 37. The method of claim 36, wherein the hydrophobic layer material has a polarization dependent loss of 0.01 dB/cm or less. 38. The method of claim 1, wherein the hydrophobic layer material has a glass transition temperature or 200 C or greater. 39. The method of claim 1, wherein the hydrophobic layer material is perfluorinated. 40. The method of claim 1, wherein the hydrophobic layer material is comprised of less than 10% H.
41. The method of claim 40, wherein the hydrophobic layer material is comprised of less than 5% H.
42. The method of claim 41, wherein the hydrophobic layer material is comprised of less than 1% H.
43. The method of claim 1, wherein the hydrophobic layer material is both the core layer and at least one of the lower and upper cladding layers, wherein the refractive index of the core layer and the at least one lower and upper cladding layers is from 0.1% to 3%. 44. The method of claim 43, wherein the at least one lower and upper cladding layers and the core layer are both hydrophobic hybrid organic inorganic layers but varying differing from each other in the organic and/or inorganic components. 45. The method of claim 1, wherein the difference in refractive index between the core and cladding layers is greater than 1%. 46. The method of claim 1, wherein the hydrophobic layer material has a surface roughness Rq of 10 nm or less. 47. The method of claim 46, wherein the hydrophobic layer material has a surface roughness Rq of 5 nm or less. 48. The method of claim 47, wherein the hydrophobic layer material has a surface roughness Rq of 1 nm or less. 49. The method of claim 1, wherein the deposited hydrophobic layer material is patterned and has a sidewall roughness Rq of 50 nm or less. 50. The method of claim 49, wherein the hydrophobic layer material is patterned and has a sidewall roughness Rq of 10 nm or less. 51. The method of claim 50, wherein the hydrophobic layer material is patterned and has a sidewall roughness Rq of 5 nm or less. 52. The method of claim 51, wherein the hydrophobic layer material is patterned and has a sidewall roughness Rq of 1 nm or less. 53. The method of claim 1, wherein the hydrophobic layer material is patterned to form apertures and/or ridges having a feature size of 100 nm or less. 54. The method of claim 53, wherein the hydrophobic layer material is patterned to form apertures and/or ridges having a feature size of 50 nm or less. 55. The method of claim 1, wherein at least a portion of the hydrophobic layer material is a fluorinated organic moiety. 56. The method of claim 1, wherein at least a portion of the hydrophobic layer material is an inorganic moiety. 57. The method of claim 56, wherein the inorganic moiety is a metal oxide backbone. 58. The method of claim 1, wherein the hydrophobic layer material is deposited by spin coating, spray coating or dip coating. 59. The method of claim 58, wherein the hydrophobic layer material is deposited by spin coating. 60. The method of claim 58, wherein the hydrophobic layer material is deposited by spray coating. 61. The method of claim 1, wherein the deposited hydrophobic layer material has a hydrophobicity that results in a water contact angle of 100 degrees or more. 62. The method of claim 61, wherein the deposited hydrophobic layer material has a water contact angle of 125 degrees or more. 63. The method of claim 62, wherein the deposited hydrophobic layer material has a water contact angle of 150 degrees or more. 64. The method of claim 1, wherein the hydrophobic layer material is directly patterned by application of electromagnetic energy and a developer, prior to depositing the upper cladding layer. 65. The method of claim 1, wherein the hydrophobic layer material comprises an organic dopant or an inorganic liquid crystal dopant. 66. The method of claim 1, wherein the refractive index of the hydrophobic material is tunable by application of UV light, visible light, infrared light, X-rays, electron beam or ion beam prior to depositing the upper cladding layer. 67. The method of claim 1, wherein the deposited hydrophobic layer material has a glass transition temperature of 200 C or more. 68. The method of claim 67, wherein the deposited hydrophobic layer material has a glass transition temperature of 250 C or more. 69. The method of claim 68, wherein the deposited hydrophobic layer material has a glass transition temperature of 310 C or more. 70. The method of claim 1, wherein the deposited hydrophobic layer has a thermo-optic coefficient (dn/dT) greater than |10×10e5|. 71. The method of claim 1, wherein the hydrophobic layer is directly patterned by exposure to electromagnetic energy via a gray scale mask, followed by removal of a portion of the hydrophobic layer with a developer. 72. The method of claim 1, wherein the hydrophobic layer is patterned, the patterning of the hydrophobic layer comprises directing electromagnetic energy at the hydrophobic layer followed by providing a developer to remove portions of the hydrophobic layer. 73. The method of claim 1, wherein the hydrophobic layer material is formed with a repeating -M-O-M-O— backbone having at least one organic substituent, the material having a molecular weight of from 500 to 10000, where M is boron, a metalloid or a metal, and O is oxygen. 74. The method of claim 73, wherein the molecular weight is from 1500 to 3000. 75. 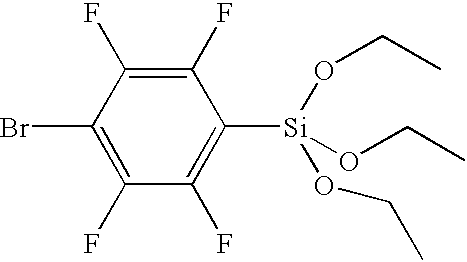 The method of claim 74, wherein the organic substitutent is fully fluorinated. 76. The method of claim 75, wherein more than one different organic substituent is bound to the repeating -M-O-M-O backbone, and wherein each organic substituent is fully or partially fluorinated. 77. The method of claim 76, wherein the hydrophobic layer material comprises organic cross linking groups between adjacent -M-O-M-O— strands. 78. The method of claim 73, wherein the organic cross linking groups are fully or partially fluorinated. 79. 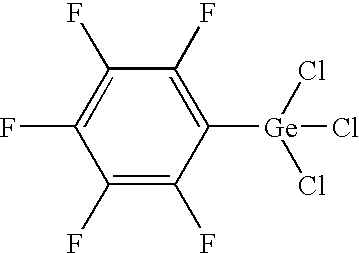 The method of claim 78, wherein the organic cross linking groups are perfluorinated groups. 80. The method of claim 73, wherein the at least one organic substitutent is a single or multi ring aryl group or an alkyl group having 5 or more carbons. 81. The method of claim 80, wherein the aryl or alkyl group is fluorinated or deuterated. 82. The method of claim 81, wherein the aryl or alkyl group is fluorinated. 83. The method of claim 82, wherein the at least one organic substituent is a fluorinated phenyl or fluorinated C1-C5 alkyl group. 84. The method of claim 83, wherein the fluorinated phenyl group is substituted with fluorinated methyl, ethyl or alkenyl groups. 85. The method of claim 73, wherein M is B, Al, Si, Ge, Sn, Sb, Pb, Ta, Ti, Zr, Er, Yb and/or Nb. 86. The method of claim 85, wherein M is B, Al, Si, Ge, Sn, Sb or Pb. 87. The method of claim 86, wherein M is Ta, Ti, Zr or Nb. 88. The method of claim 87, wherein M is B, Al and/or Si. 89. The method of claim 73, wherein the at least one organic substituent is a straight or branched chain having 5 or more carbons. 90. The method of claim 73, wherein either the at least one organic substituent is an aryl group that is a single ring or polycyclic aromatic substituent. 91. 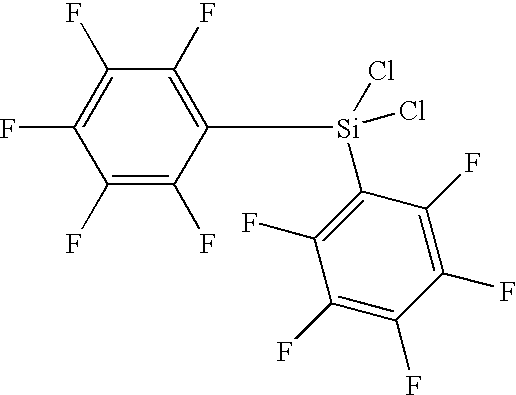 The method of claim 90, wherein the at least one organic substituent is a fully or partially fluorinated single ring or polycyclic aromatic substituent. 92. The method of claim 91, wherein either the at least one organic substituent has one or two rings. 93. The method of claim 1, wherein the hydrophobic layer is deposited by spinning or spraying onto the substrate, the hydrophobic layer comprising a material having a molecular weight of from 500 to 10000. 94. The method of claim 93, further comprising baking the hydrophobic layer material after depositing onto the substrate. 95. The method of claim 94, wherein the material is exposed to the electromagnetic radiation via the gray scale mask so as to selectively further cross link the material and increase the molecular weight of the material in selected areas. 96. The method of claim 95, wherein the electromagnetic energy has a wavelength of from 13 nm to 700 nm. 97. The method of claim 95, wherein a developer is applied to remove material in unexposed areas. 98. The method of claim 93, wherein the material is deposited after mixing with a solvent. 99. The method of claim 98, wherein the solvent is selected from isopropanol, ethanol, methanol, THF, mesitylene, toluene, cyclohexanone, cyclopentanone, dioxane, methyl isobutyl ketone, or perfluorinated toluene. 100. The method of claim 88, wherein M is Si. 101. The method of claim 98, wherein the material is mixed with a solvent and a thermal initiator or photoinitiator prior to deposition. 102. The method of claim 101, wherein a photoinitiator is mixed with the material and solvent prior to spin on, the photoinitiator undergoing free radical formation when exposed to light so as to cause polymerization in the hydrophobic material. 103. The method of claim 96, wherein the electromagnetic energy is ultraviolet light. 104. The method of claim 103, wherein the ultraviolet light is directed on the hydrophobic layer via a mask so as to expose portions of the hydrophobic layer, and wherein the developer removes non-exposed portions of the hydrophobic layer. 105. The method of claim 1, wherein the lower cladding layer and/or upper cladding layer comprises a hybrid organic-inorganic material. 106. The method of claim 1, further comprising providing a light emittor or photodetector on the substrate proximate to the waveguide. 108. The method of claim 106, wherein the light emittor is a laser or LED. 109. The method of claim 106, wherein the laser is a VCSEL. 110. The method of claim 106, wherein the light emittor is a monolithic Fabry-Perot laser, a monolithic Bragg laser, a monolithic distributed feedback laser or a semiconductor quantum well laser. 111. The method of claim 106, wherein the light emittor is a single-frequency laser. 112. The method of claim 111, wherein the single frequency laser is a distributed feedback laser. 113. The method of claim 108, wherein the light emittor is a multi-frequency laser. 115. The method of claim 1, wherein the substrate is a semiconductor, glass or plastic substrate. 116. The method of claim 115, wherein the substrate is a silicon substrate. 117. The method of claim 1, wherein the waveguide is formed as a coupler between a fiber and a photodetector or light emittor. 118. The method of claim 73, wherein the hydrophobic material comprises fluorinated cross linking groups between M elements in a three dimensional -M-O-M-O— lattice. 119. The method of claim 118, wherein the organic cross linking group is fully fluorinated. 120. The method of claim 73, comprising three or more different organic groups bound to the -M-O-M-O— backbone. 121. The method of claim 73, further comprising a dopant D that is a metalloid or early transition metal and is different from M, and is bound to the -M-O-M-O— lattice and alters the refractive index of the hydrophobic material compared to an -M-O-M-O— lattice without a dopant. 122. The method of claim 121, wherein the dopant is an early transition metal. 123. The method of claim 122, wherein the dopant is tantalum, zirconium, germanium or titanium. 124. The method of claim 121, wherein the dopant is a metalloid. 125. The method of claim 124, wherein the dopant is germanium. 126. The method of claim 1, wherein the deposited hydrophobic layer material is capable of being heated in supercritical water vapor at 2 atm and at 120 C for 2 hours after which optical absorption, polarization dependent loss and refractive index change remain unchanged ±5%. 127. The method of claim 1, wherein the deposited hydrophobic layer material is capable of being heated in supercritical water vapor at 2 atm and at 120 C for 2 hours after which the chemical structure of the hydrophobic layer material is less than 5% changed. 128. The method of claim 1, wherein the deposited hydrophobic layer material is capable of being heated in supercritical water vapor at 2 atm and at 120 C for 2 hours after which the chemical structure of the hydrophobic layer material is unchanged. 129. The method of claim 1, wherein the waveguide is part of an N-port splitter with cascading Y-couplers. 130. The method of claim 1, wherein the waveguide is part of a planar crossover. 131. The method of claim 1, wherein the waveguide is formed as part of an integrated optical circuit. 132. The method of claim 131, wherein the integrated optical circuit comprises one or more of a light emittor, a photodetector, an amplifier and a switch. 133. The method of claim 1, wherein the waveguide is formed within a multi-device assembly on a single substrate. 134. The method of claim 133, wherein the multi-device assembly is a wavelength division multiplexor receiver assembly. 135. The method of claim 134, wherein the wavelength division multiplexor receiver assembly comprises one or more arrayed waveguide gratings, an amplifier, and one or more PIN diode receivers. 136. The method of claim 133, wherein the multi-device assembly comprises a plurality of lasers, a plurality of external modulators, a combiner and amplifier. 137. The method of claim 1, further comprising fabricating a photodetector or light emittor proximate to the waveguide on the substrate. 138. The method of claim 1, further comprising dropping in a prefabricated photodetector or light emittor proximate to the waveguide. 139. The method of claim 1, wherein the waveguide is formed as a coupler between a fiber and either a photodetector or light emittor. 140. The method of claim 1, wherein the hydrophobic layer material is doped. 141. The method of claim 140, wherein the dopant is erbium. 142. The method of claim 1, wherein the waveguide formed is part of an EDFA. 143. The method of claim 142, wherein the EDFA is a multistage EDFA. 144. The method of claim 1, wherein the waveguide is part of a coupler. 145. The method of claim 144, wherein the coupler is a resonant coupler. 146. The method of claim 1, wherein the waveguide is part of a wavelength coupler or splitter. 147. The method of claim 1, wherein the waveguide is part of an isolator. 148. The method of claim 1, wherein the waveguide is a portion of a waveguide grating router. 149. The method of claim 1, wherein the waveguide is part of a filter, modulator or switch. 150. The method of claim 1, wherein the waveguide is within a gain compensator dev., integrated EDWA, monolithic DCM, reconfigurable OADM, or optical channel monitor. 151. The method of claim 1, wherein the waveguide is part of a concentrator chip, AWG multiplexor chip, thermo optic VOA, dispersion compensator, gain flattening filter, tunable waveguide grating, switch, coupler, modulator, waveguide polarizer, splitter, interleaver, isolator or tap. 152. 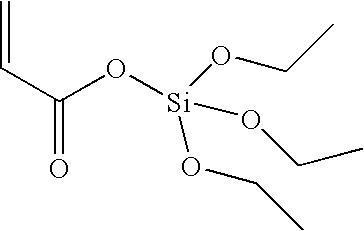 The method of claim 1, wherein the hydrophobic material is a siloxane. 153. The method of claim 1, wherein at least the core layer is the hydrophobic layer. 154. The method of claim 1, wherein at least one of the cladding layers is the hydrophobic layer. 155. The method of claim 1, further comprising a passivation layer on the upper cladding layer. 156. The method of claim 153, wherein the lower cladding layer, the upper cladding layer and the core layer are the hydrophobic layers. 157. The method of claim 73, wherein the hydrophobic material comprises between 2 and 6 different organic substituents on an inorganic three dimensional backbone matrix. 158. The method of claim 93, wherein the molecular weight is from 500 to 5000. 159. The method of claim 158, wherein the molecular weight is from 500 to 3000. 160. The method of claim 1, wherein the hydrophobic layer is patterned with a laser. 161. The method of claim 105, wherein the hybrid material is fully or partially fluorinated. 162. The method of claim 108, wherein the LED is an OLED. 163. The method of claim 1, wherein the hydrophobic material has an optical loss of 0.1 dB/cm at 1550 nm, is deposited at 200 C or less, a polarization dependent loss of 0.1 dB/cm or less and a surface roughness of 10 nm or less. 164. The method of claim 1, further comprising forming a buffer layer on the substrate before forming the lower cladding layer. 165. The method of claim 164, wherein the buffer layer has a hydrophobicity that results in a contact angle of 90 degrees or more if exposed to water. 166. The method of claim 1, wherein the core layer is formed by depositing a core material followed by patterning the core material to form an elongated core. 167. The method of claim 166, wherein the patterning of the core material is by direct ultraviolet light patterning. 168. The method of claim 1, wherein the waveguide formed is an optical waveguide for UV, visible and/or ultraviolet light. 169. The method of claim 1, wherein the hydrophobic layer material has a thickness of from 1 to 10 molecular layers. 170. The method of claim 73, wherein the repeating -M-O-M-O— backbone is a three dimensional matrix. 171. The method of claim 170, wherein both the core layer and the cladding layers have a repeating -M-O-M-O— backbone with organic substituents, but where one or more metals “M” in the core layer backbone are different or in different amounts than in the cladding layers. 172. The method of claim 170, wherein both the core layer and the cladding layers have a repeating -M-O-M-O— backbone with one or more organic substitutents bound thereto, but where the one or more organic substutituents in the core layer are different or in different amounts than in the cladding layers. 173. A waveguide made by the method of claim 1.
a waveguide layer, wherein the waveguide layer has a hydrophobicity that results in a water contact angle of 90 degrees or more. 175. The waveguide of claim 174, further comprising a lower cladding layer and an upper cladding layer proximate to said waveguide layer. wherein the lower cladding layer, the core layer and/or the upper cladding layer is hydrophobic and results, if exposed to water, in a water contact angle of 90 degrees or more. 177. The waveguide of claim 176, wherein the material of the hydrophobic layer is a hybrid organic-inorganic material. 178. The waveguide of claim 176, wherein the substrate is an integrated circuit substrate. 179. The waveguide of claim 176, wherein the substrate is a glass, quartz, semiconductor, ceramic or plastic substrate. 180. The waveguide of claim 179, wherein the substrate is a glass or quartz substrate. 181. The waveguide of claim 179, wherein the substrate is a semiconductor substrate. 182. The waveguide of claim 181, wherein the substrate is a silicon or germanium substrate. 183. The waveguide of claim 176, wherein the substrate comprises photonic and/or electronic circuitry thereon. 184. The waveguide of claim 183, wherein the circuitry is disposed on the substrate between the lower cladding layer and the substrate. 185. The waveguide of claim 176, wherein the substrate is a printed circuit board. 186. The waveguide of claim 176, wherein the hydrophobic layer has an optical loss of less than 0.1 dB/cm at 1550 nm. 187. The waveguide of claim 186, wherein the hydrophobic layer has an optical loss of less than 0.09 dB/cm at 1550 nm. 188. The waveguide of claim 187, wherein the hydrophobic layer has an optical loss of less than 0.075 dB/cm at 1550 nm. 189. The waveguide of claim 176, wherein the hydrophobic layer has an optical loss of less than 0.1 dB/cm at 1310 nm. 190. The waveguide of claim 176, wherein the hydrophobic layer has an optical loss of less than 0.1 dB/cm at C Band. 191. The waveguide of claim 176, wherein the hydrophobic layer has an optical loss of less than 0.1 dB/cm at L Band. 192. The waveguide of claim 188, wherein the hydrophobic layer has an optical loss of less than 0.05 dB/cm at 1550 nm. 193. The waveguide of claim 189, wherein the hydrophobic layer has an optical loss of less than 0.075 dB/cm at 1310 nm. 194. The waveguide of claim 190, wherein the hydrophobic layer has an optical loss of less than 0.075 dB/cm at C Band. 195. The waveguide of claim 191, wherein the hydrophobic layer has an optical loss of less than 0.075 dB/cm at L Band. 196. The waveguide of claim 1, wherein the deposited hydrophobic layer material is capable of being heated in supercritical water vapor at 2 atm and at 120 C for 2 hours after which optical absorption, polarization dependent loss and/or refractive index change remains unchanged ±5%. 197. The waveguide of claim 176, wherein the hydrophobic layer material has a birefringence of less than 5×10e-5. 198. The waveguide of claim 197, wherein the hydrophobic layer material has a birefringence of less than 2×10e-5. 199. The waveguide of claim 198, wherein the hydrophobic layer material has a birefringence of less than 1×10e-6. 200. The waveguide of claim 176, wherein the hydrophobic layer material is directly patterned to have a surface topography where the aspect ratio is at least 2:1. 201. The waveguide of claim 200, wherein the hydrophobic layer material is directly patterned to have a surface topography where the aspect ratio is at least 3:1. 202. The waveguide of claim 201, wherein the hydrophobic layer material is directly patterned to have a surface topography where the aspect ratio is at least 10:1. 203. The waveguide of claim 176, wherein the hydrophobic layer material is deposited at a rate of 100 um/min. 204. The waveguide of claim 176, wherein the hydrophobic layer material has a thickness of from 0.1 um to 100 um after a single deposition step. 205. The waveguide of claim 204, wherein the hydrophobic layer material has a thickness of from 0.5 um to 50 um after a single deposition step. 206. The waveguide of claim 176, wherein the hydrophobic layer material has a thickness of from 1 um to 20 um after a single deposition step. 207. The waveguide of claim 176, wherein the hydrophobic layer material has a polarization dependent loss of 0.1 dB/cm or less. 208. The waveguide of claim 207, wherein the hydrophobic layer material has a polarization dependent loss of 0.05 dB/cm or less. 209. The waveguide of claim 208, wherein the hydrophobic layer material has a polarization dependent loss of 0.01 dB/cm or less. 210. The waveguide of claim 176, wherein the hydrophobic layer material has a glass transition temperature or 200 C or greater. 211. The waveguide of claim 176, wherein the hydrophobic layer material is perfluorinated. 212. The waveguide of claim 176, wherein the hydrophobic layer material is comprised of less than 10% H.
213. The waveguide of claim 40, wherein the hydrophobic layer material is comprised of less than 5% H.
214. The waveguide of claim 213, wherein the hydrophobic layer material is comprised of less than 1% H.
215. The waveguide of claim 176, wherein the hydrophobic layer material has a tunable refractive index. 216. The waveguide of claim 176, wherein the hydrophobic layer material is both the core layer and at least one of the lower and upper cladding layers, wherein the refractive index of the core layer and the at least one lower and upper cladding layers is from 0.1% to 3%. 217. The waveguide of claim 176, wherein the hydrophobic layer material is both the core layer and at least one of the lower and upper cladding layers, wherein the refractive index of the core layer and the at least one lower and upper cladding layers is from 1% to 3%. 218. The waveguide of claim 176, wherein the hydrophobic layer material has a surface roughness Rq of 10 nm or less. 219. The waveguide of claim 218, wherein the hydrophobic layer material has a surface roughness Rq of 5 nm or less. 220. The waveguide of claim 219, wherein the hydrophobic layer material has a surface roughness Rq of 1 nm or less. 221. The waveguide of claim 176, wherein the hydrophobic layer material is a patterned layer with a sidewall roughness Rq of 50 nm or less. 222. The waveguide of claim 221, wherein the hydrophobic layer material is a patterned layer with a sidewall roughness Rq of 10 nm or less. 223. The waveguide of claim 222, wherein the hydrophobic layer material is a patterned layer with a sidewall roughness Rq of 5 nm or less. 224. The waveguide of claim 223, wherein the hydrophobic layer material is a patterned layer with a sidewall roughness Rq of 1 nm or less. 225. The waveguide of claim 176, wherein the hydrophobic layer material is a patterned layer with apertures and/or ridges having a feature size of 100 nm or less. 226. The waveguide of claim 225, wherein the hydrophobic layer material is a patterned layer with apertures and/or ridges having a feature size of 50 nm or less. 227. The waveguide of claim 176, wherein at least a portion of the hydrophobic layer material is a fluorinated organic moiety. 228. The waveguide of claim 176, wherein at least a portion of the hydrophobic layer material is an inorganic moiety. 229. The waveguide of claim 228, wherein the inorganic moiety is a metal oxide backbone. 230. The waveguide of claim 176, wherein the hydrophobic layer material has a hydrophobicity that results in a water contact angle of 100 degrees or more. 231. The waveguide of claim 230, wherein the hydrophobic layer material has a water contact angle of 125 degrees or more. 232. The waveguide of claim 231, wherein the hydrophobic layer material has a water contact angle of 150 degrees or more. 233. The waveguide of claim 176, wherein the hydrophobic layer material comprises an organic dopant or an inorganic liquid crystal dopant. 234. The waveguide of claim 176, wherein the hydrophobic layer material has a glass transition temperature of 200 C or more. 235. The waveguide of claim 234, wherein the hydrophobic layer material has a glass transition temperature of 250 C or more. 236. The waveguide of claim 235, wherein the hydrophobic layer material has a glass transition temperature of 310 C or more. 237. The waveguide of claim 176, wherein the hydrophobic layer has a thermo-optic coefficient greater than |10×10e5|. 238. The waveguide of claim 176, wherein the hydrophobic layer material comprises a repeating -M-O-M-O— backbone having at least one organic substituent, the material having a molecular weight of from 500 to 10000, where M is boron, a metalloid or a metal, and O is oxygen. 239. The waveguide of claim 238, wherein the molecular weight is from 1500 to 3000. 240. The waveguide of claim 238, wherein the organic substitutent is fully fluorinated. 241. The waveguide of claim 238, wherein more than one different organic substituent is bound to the repeating -M-O-M-O backbone, and wherein each organic substituent is fully or partially fluorinated. 242. The waveguide of claim 238, wherein the hydrophobic layer material comprises organic cross linking groups between adjacent -M-O-M-O— strands. 243. The waveguide of claim 242, wherein the organic cross linking groups are fully or partially fluorinated. 244. 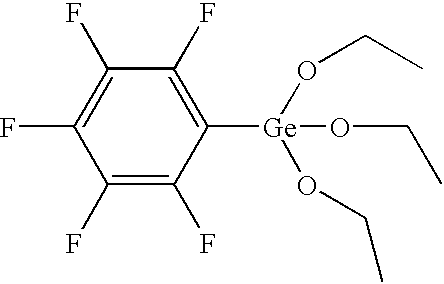 The waveguide of claim 243, wherein the organic cross linking groups are perfluorinated groups. 245. The waveguide of claim 238, wherein the at least one organic substitutent is a single or multi ring aryl group or an alkyl group having 5 or more carbons. 246. The waveguide of claim 245, wherein the aryl or alkyl group is fluorinated or deuterated. 247. The waveguide of claim 246, wherein the aryl or alkyl group is fluorinated. 248. 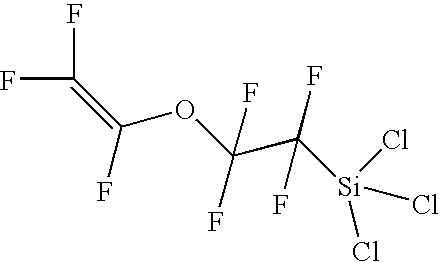 The waveguide of claim 238, wherein the at least one organic substituent is a fluorinated phenyl or fluorinated alkyl group having from 1 to 5 carbons. 249. The waveguide of claim 248, wherein the fluorinated phenyl group is substituted with fluorinated methyl, ethyl or alkenyl groups. 250. The waveguide of claim 238, wherein M is B, Al, Si, Ge, Sn, Sb, Pb, Ta, Ti, Zr, Er, Yb and/or Nb. 251. The waveguide of claim 250, wherein M is B, Al, Si, Ge, Sn, Sb or Pb. 252. The waveguide of claim 251, wherein M is Ta, Ti, Zr or Nb. 253. The waveguide of claim 252, wherein M is B, Al and/or Si. 254. The waveguide of claim 238, wherein the at least one organic substituent is a straight or branched chain having 5 or more carbons. 255. The waveguide of claim 238, wherein either the at least one organic substituent is an aryl group that is a single ring or polycyclic aromatic substituent. 256. The waveguide of claim 255, wherein the at least one organic substituent is a fully or partially fluorinated single ring or polycyclic aromatic substituent. 257. The waveguide of claim 256, wherein either the at least one organic substituent has one or two rings. 258. The waveguide of claim 176, wherein the hydrophobic layer comprises a material having a molecular weight of from 500 to 10000. 259. The waveguide of claim 238, wherein M is Si. 260. The waveguide of claim 176, wherein the lower cladding layer and/or upper cladding layer comprises a hybrid organic-inorganic material. 261. The waveguide of claim 176, further comprising a light emittor or photodetector on the substrate proximate to the waveguide. 263. The waveguide of claim 261, wherein the light emittor is a laser or LED. 264. The waveguide of claim 261, wherein the laser is a VCSEL. 265. The waveguide of claim 261, wherein the light emittor is a monolithic Fabry-Perot laser, a monolithic Bragg laser, a monolithic distributed feedback laser or a semiconductor quantum well laser. 266. The waveguide of claim 261, wherein the light emittor is a single-frequency laser. 267. The waveguide of claim 266, wherein the single frequency laser is a distributed feedback laser. 268. The waveguide of claim 261, wherein the light emittor is a multi-frequency laser. 270. The waveguide of claim 176, wherein the substrate is a semiconductor, glass or plastic substrate. 271. The waveguide of claim 176, wherein the substrate is a silicon substrate. 272. The waveguide of claim 176, wherein the waveguide is formed as a coupler between a fiber and a photodetector or light emittor. 273. The waveguide of claim 238, wherein the hydrophobic material comprises fluorinated cross linking groups between M elements in a three dimensional -M-O-M-O— lattice. 274. The waveguide of claim 273, wherein the organic cross linking group is fully fluorinated. 275. The waveguide of claim 238, comprising three or more different organic groups bound to the -M-O-M-O— backbone. 276. The waveguide of claim 238, further comprising a dopant D that is a metalloid or early transition metal and is different from M, and is bound to the -M-O-M-O— lattice and alters the refractive index of the hydrophobic material compared to an -M-O-M-O— lattice without a dopant. 277. The waveguide of claim 276, wherein the dopant is an early transition metal. 278. The waveguide of claim 277, wherein the dopant is tantalum, zirconium, germanium or titanium. 279. The waveguide of claim 276, wherein the dopant is a metalloid. 280. The waveguide of claim 279, wherein the dopant is germanium. 281. The waveguide of claim 176, wherein the waveguide is part of an N-port splitter with cascading Y-couplers. 282. The waveguide of claim 176, wherein the waveguide is part of a planar crossover. 283. The waveguide of claim 176, wherein the waveguide is formed as part of an integrated optical circuit. 284. The waveguide of claim 283, wherein the integrated optical circuit comprises one or more of a light emittor, a photodetector, an amplifier and a switch. 285. The waveguide of claim 176, wherein the waveguide is formed within a multi-device assembly on a single substrate. 286. The waveguide of claim 285, wherein the multi-device assembly is a wavelength division multiplexor receiver assembly. 287. The waveguide of claim 286, wherein the wavelength division multiplexor receiver assembly comprises one or more arrayed waveguide gratings, an amplifier, and one or more PIN diode receivers. 288. The waveguide of claim 285, wherein the multi-device assembly comprises a plurality of lasers, a plurality of external modulators, a combiner and amplifier. 289. The waveguide of claim 176, formed proximate to a photodetector or light emittor on the substrate. 290. The waveguide of claim 176, wherein the waveguide is formed as a coupler between a fiber and either a photodetector or light emittor. 291. The waveguide of claim 176, wherein the hydrophobic layer material is doped. 292. The waveguide of claim 291, wherein the dopant is erbium. 293. The waveguide of claim 176, wherein the hydrophobic material is a siloxane. 294. The waveguide of claim 176, wherein at least the core layer is the hydrophobic layer. 295. The waveguide of claim 176, wherein at least one of the cladding layers is the hydrophobic layer. 296. The waveguide of claim 176, further comprising a passivation layer on the upper cladding layer. 297. The waveguide of claim 176, wherein the lower cladding layer, the upper cladding layer and the core layer are the hydrophobic layers. 298. The waveguide of claim 176, wherein the hydrophobic material comprises between 2 and 6 different organic substituents on an inorganic three dimensional backbone matrix. 299. The waveguide of claim 238, wherein the molecular weight is from 500 to 5000. 300. The waveguide of claim 238, wherein the molecular weight is from 500 to 3000. 301. The waveguide of claim 177, wherein the hybrid material is fully or partially fluorinated. 302. The waveguide of claim 263, wherein the LED is an OLED. 303. The waveguide of claim 176, wherein the hydrophobic material has an optical loss of 0.1 dB/cm at 1550 nm, is deposited at 200 C or less, a polarization dependent loss of 0.1 dB/cm or less and a surface roughness of 10 nm or less. 304. The waveguide of claim 176, further comprising forming a buffer layer on the substrate before forming the lower cladding layer. 305. The waveguide of claim 304, wherein the buffer layer has a hydrophobicity that results in a contact angle of 90 degrees or more if exposed to water. 306. The waveguide of claim 176, wherein the core layer is formed by depositing a core material followed by patterning the core material to form an elongated core. wherein the core layer and/or upper cladding layer is hydrophobic and results, if exposed to water, in a water contact angle of 90 degrees or more. 309. The method of claim 308, wherein the substrate is a light transmissive substrate. 310. The method of claim 309, wherein the light transmissive substrate is a plastic, glass, quartz or sapphire substrate. 311. The method of claim 310, wherein the light transmissive substrate is quartz. 312. The method of claim 309, wherein the substrate acts as a lower cladding layer for the waveguide. 313. The method of claim 309, wherein the core layer is formed directly on the substrate in the absence of a lower cladding layer.